In July, SPIE CEO Dr. Eugene Arthurs announced his intent to retire effective on Jan. 19, 2018. Arthurs has been an SPIE member since 1972 and joined the society’s staff as executive director in 1999. In that time, he has led technology companies through growth and acquisitions, taught, and challenged himself as a researcher. As he steps down from SPIE’s top role, Arthurs intends to remain involved with the society through analysis and advocacy. 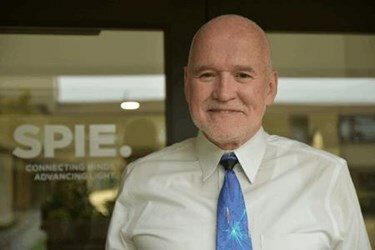 Recently, Dr, Arthurs graciously made time to reflect on his career at SPIE, as well as his and the organization’s future, with Photonics Online. 1.) You’ve called your tenure as SPIE CEO “one great prolonged wonderful experience.” What are your principal goals for the society between now and January (2018), and do you feel like you’ve left anything incomplete that you’d expected to accomplish during your time at the helm? I am in an unusual position. I have always thought long term, and now with only a few months remaining, I still have many goals for SPIE. SPIE has a very competent staff and they share the intent to continuously change to ensure that SPIE brings real value to the large optics and photonics community, and through that, to this fragile planet. The value proposition for associations keeps evolving, and as much of our technical advances are behind the changes, in our case it is a sort of self-inflicted pain. In the next few months, however, execution must be the focus for SPIE. In mid-August, we began hosting our massive digital library, an organic, extraordinarily valuable archive of information. This was the culmination of an exceptional effort and, to the surprise of software-project skeptics, it was completed on time. Going forward, we know that as people use this resource, they will have ideas on improving it. We will be listening carefully and implementing judiciously, as SPIE DNA demands. This will be high priority over the coming months. A large part of my remaining time in this position also will focus on our 2018 events. Photonics West 2018 will get a lot of attention, as will our other spring meetings. We will have some thinking to do about our Medical Imaging and Astronomical Telescopes + Instrumentation meetings; they are set for Houston and Austin, Texas, which will be recovering from the devastation from Hurricane Harvey. 2.) You’ve said you will remain connected to the society through “analysis and advocacy.” At this time, what do you envision those activities will entail? I am obsessed with understanding the complexities of innovation and the dynamics of markets, specifically those related to or enabled by optics and photonics. I do not see that interest waning, and will have more time to work on these ever-shifting mysteries. SPIE is an actor in both of these, and I expect will continue to be the positive influence it has been for decades. On advocacy, I have come to realize more and more that one of the formidable challenges for science is the widening fault lines between politicians and scientists. We have been bad at communicating our role and value. C. P. Snow’s concerns about the two cultures may have underestimated the sorry situation in which we find ourselves. With the simplified access to information (enabled through our community’s technologies! ), the tendency to seek only pieces that support one’s position and the ease with which halftruths (a charitable descriptor) can propagate, there is a growing need for trustworthy, fact-based communication about what science and technology do, might do, and can’t do, with those whom we have chosen as policy-makers. SPIE, working with the OSA and others, has taken an increasing responsibility in informing U.S. policymakers on behalf of their members. I hope to continue to contribute as best I can to this urgent and vital challenge. 3.) In that same vein, the current U.S. administration’s 2018 budget proposals heavily defund education initiatives, including those supporting STEM education through programs, resources, and teacher preparation. How can the optics & photonics community bridge the seemingly growing divide between scientists and policymakers? I think the first imperative is consensus in our community that there is a problem and that it needs to be addressed. We are good at solving problems when we know what they are. The media can play a big role in getting the message across that government plays a determinative role both in science and in the impact of new science. By and large, industry has abandoned basic research, certainly serendipitous research. We shareholders (i.e., most of us saving for retirement) demand that companies turn in better and better quarterly results. Betting on research that might or might not lead to profits 10 or 20 years from now doesn’t cut it with financial analysts. We are learning how to work with politicians, and again in the case of OSA and SPIE, we are contracting with people who know the ropes. We may be brilliant at science and engineering, but we are still naifs in the political world. And this will not be “a one and done.” This must be a concerted, persistent effort. 4.) Education has been a prominent theme in your past discussions with media. In particular, I’m drawn to your repeated use of the phrase “global thinker.” What does that phrase mean to you, and how can engineers – both experienced and new to their field – adopt this mindset and use it to serve their endeavors? I strongly believe that to be successful today in our technology — and in much else — one must think globally. The days when all the advances in science were localized in a few centers, first in Europe, and then in the U.S., are well behind us; likewise the old patterns for customers. With student chapters in 53 countries, we at SPIE have seen firsthand the talent and creativity across the world — talent that may be more motivated than that of those of us who are comfortable. Today’s scientist or engineer should be making him- or herself aware of competitors and collaborators across the world. Industry is obviously aware of how manufacturing costs compare, and increasingly of where R&D talent is more affordable. Sales are now also spread much more widely. U.S. dominance as the supplier of lasers, for example, is a fading memory, and competitors with high-quality products are popping up in places formerly considered “far behind.” To win in the game going forward, no matter where one is based, it is important to see the opportunities and threats. Get out there with an open mind. 5.) What is the intrinsic quality of optics & photonics that has kept you so engaged for 45+ years in the industry, and compels you to continue with analysis and advocacy? Optics and photonics is an expanding, exciting and dynamic field with mind-boggling opportunities, and is populated by creative and brilliant people. It has changed our world for the better and much more is to come. What could be more stimulating? 6.) You’ve mentioned that your favorite recent advances in optics & photonics technologies deal with imaging — particularly medical imaging and optogenetics. As metamaterials and new techniques enable the proliferation of O&P technologies into new areas (e.g., autonomous driving), is that still the case? Why (or why not)? I look at the problems facing us, maybe with the bias of an “old guy.” To me, advances in medical imaging and therapeutic use of optogenetics are must-haves. Autonomous driving is exciting and will save lives including perhaps my own, especially as attention spans and depth of field seem to be shrinking. Metamaterials, computational imaging, etc., will disrupt the optical world. VR and AR will enhance life, but medical imaging will extend it, and I think that is more important. Maybe I wouldn’t were I a young immortal. 7.) Looking ahead to 2018, what should attendees keep an eye out for at Photonics West 2018 and DCS 2018 (be it new technologies, new exhibitors, paper presentations, etc.)? The perennially strong and continually growing BiOS track at SPIE Photonics West includes some newer conferences that are particularly timely. Among them, High-Speed Biomedical Imaging and Spectroscopy: Toward Big Data Instrumentation and Management is in its third iteration, and Photonic Diagnosis and Treatment of Infections and Inflammatory Diseases has attracted more than 60 abstracts in its first time out. Among featured speakers, Stefan Hell of Max Planck, Ursula Keller of ETH Zürich, Hidetoshi Katori of the University of Tokyo, Berthold Schmidt pf Trumpf Photonics, Min Gu of RMIT University, Andrew Rickman of the Rockley Group, and Pallab Bhattacharya of the University of Michigan all have been confirmed. SPIE Defense and Commercial Sensing will be in Orlando this year, in accordance with its three-city rotation plan. New conferences are being organized in Additive Manufacturing for High Consequence Applications; Autonomous Systems: Sensors, Vehicles, Security and the Internet of Everything; the Future of the Internet of Things, which includes a focus on cyber-physical systems. Noteworthy sessions will cover technologies such as LiDAR, infrared, multispectral and hyperspectral imaging, phenotyping, and infrared thermography, for air, ground, and underwater applications, as well as in agriculture and food safety. Morley Stone, Air Force Research Lab Chief Technology Officer, and Ray Johnson, Executive in Residence at Bessemer Venture Partners, have confirmed as plenary speakers. BRIDG, the world’s first industry-led smart sensor consortium, and nanoelectronics research center imec Florida will participate in the exhibition and industry sessions. Best career advice you ever received: I don’t actually recall anyone explicitly giving me career advice. At home it was expectations of not settling for second, a modeled work ethic, and the important implicit value system, “you are no better than anyone else, and no one else is better than you.” I intuited enormous wisdom all along the way and am grateful to all: family, colleagues across the world, bosses, and co-workers who continue to guide me. Favorite place your travels have taken you: Back home. Most difficult technology or concept for you to grasp: There is a long list. When Einstein said “fifty years of conscious brooding have brought me no closer to answer the question, “What are light quanta?”, I don’t claim to be one of “the rascals” who knows the answer. Maybe now I’ll have time to muse on entanglement, but probably will continue to avoid string theory. If not in this industry, what would you be doing for a living? I would likely be in another industry where I could build things, where I could meet people, be on the move, and learn and feel I was accomplishing something. I have an affinity for numbers and finance but could not see myself enjoying a career behind a desk moving money around. Maybe putting it to work to create things. Perhaps I could have been in investing. Device you can’t live without? I am addicted to multiple devices; phones, tablets, and a powerful laptop. I could probably live without any of them, but now, my spectacles are mandatory. Optics again.